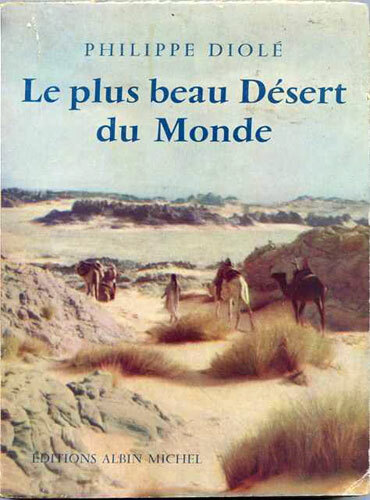 Even before I turned to camel trekking, one of my favourite Sahara books was a translation of Philippe Diole’s The Most Beautiful Desert of All (reviewed; aka: Sahara Adventure in the US). 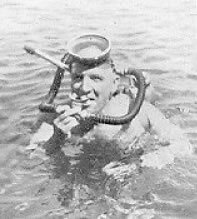 Diolé was an adventurer, author and underwater associate of Jaques Cousteau. You can watch an aged Diolé interviewed here with none other than Alain Bombard, an equally interesting character about whom I wrote this post on another blog. Attracted, as many of us are to places off the beaten track and obscure historic routes, I always thought it might be fun to try and retrace Diolé’s route across the plateau to Djanet, although even when reading the book 25 years ago I had a feeling it was a little-used path. Now it’s doubtful anyone’s been that way for decades. 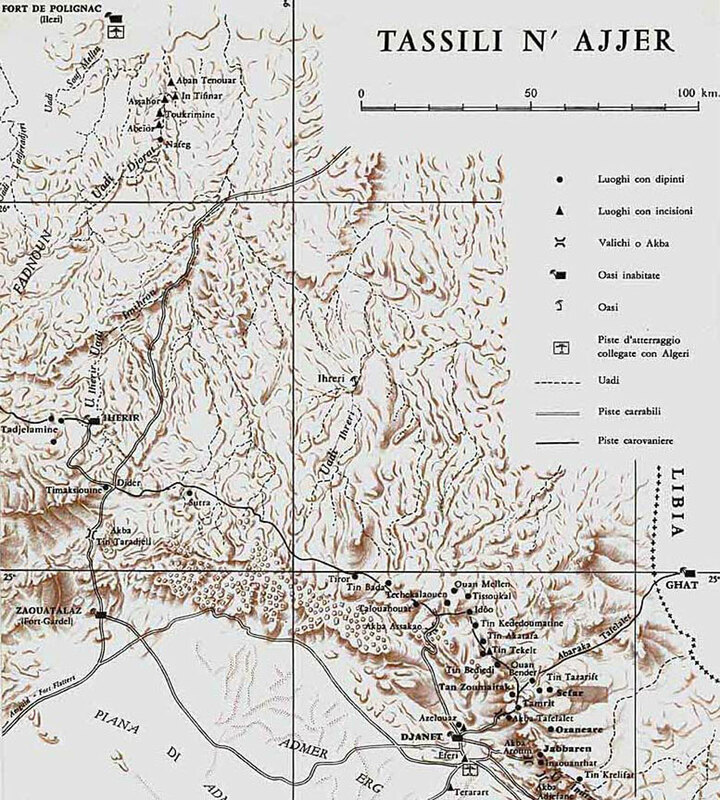 It’s a well-worn Saharan cliché, but Diolé’s route included a visit to a genuine ‘lost oasis’ that I’ve long been curious about: Ihreri, some 80km NNW of Djanet (often mistaken with the well-known but accessible Iherir on the Fadnoun). Ihreri may well resemble the similar, virtually abandoned oasis we came across on the Amguid Crater trek one time (left), set in a region prolific with Stone Age megaliths. 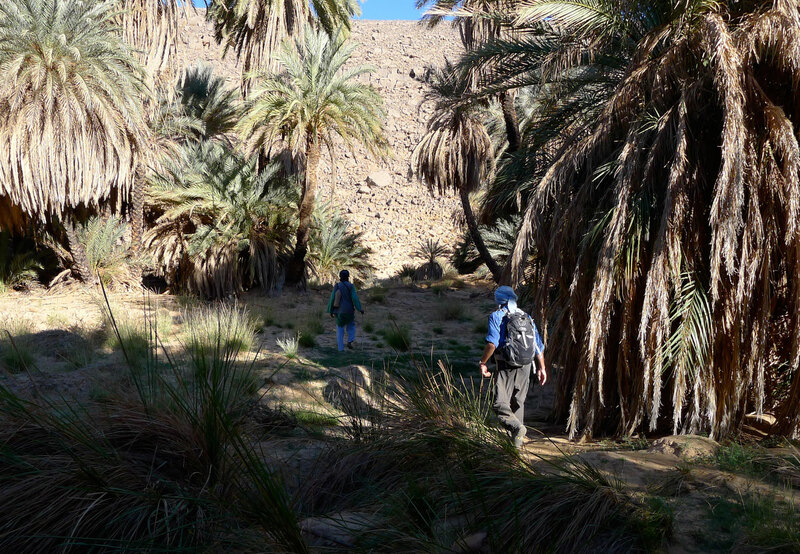 The grassy patches as well as the sudden density and rustle of date palms were quite unexpected after a week out in the open desert with nothing bar a thorny acacia for shade. I’m also sure I watched a documentary in the mid-1980s about some people trying to get to a very remote oasis in the Tassili and getting a hostile reception. For some reason I think this may have been Ihreri, occupied by the grumpy vestiges of its date-cultivating villagers. Now, it’s unlikely anyone lives there. On and off over the years I’ve tried to get the Diolé plan off the ground but without success, being told among other things it was too hard or there was very little herbage on the plateau that year. But recently I made contact with an Algerian agency that seems keen to try something out of their well-trodden comfort zone. Perhaps the easy ‘fly-in’ work is drying up these days, but sadly the price they wanted to charge was double a normal tour so that idea has gone back into storage for another few years. 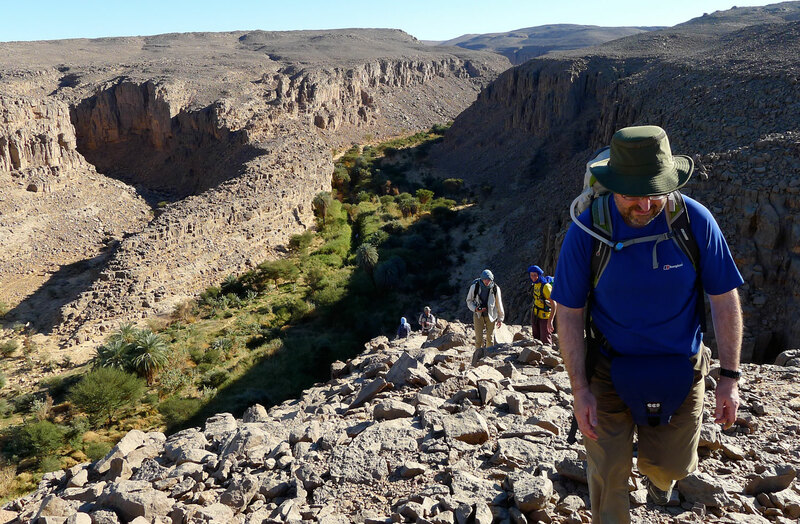 This entry was posted in Camels, Desert Babbles (blog) and tagged Alain Bombard, Amguid Crater trek, Ihreri, Imirhou, Jaques Cousteau, Oued Djerat, Philippe Diolé, Sahara Adventure, tassili n'ajjer, The Most Beautiful Desert of All on April 3, 2013 by Chris S.
Merci pour votre nouvelles Jean. Peut-être au cours des années ils ont fait une piste de camion qui commence a cote de Imirhou. Le region de Tassili est ouvert maintenant mais cet piste oublier – je ne sais pas.